I have a confession to make… growing up I was picky! Yes, I was picky when it came to the food on my plate at dinner time. I wouldn’t eat it if I didn’t like the way it looked. Yes, I was picky! My mom would say, “Jacob, stop being so picky, you’re missing out on some good foods!” However, I wouldn’t listen. Remember, I was picky. However, now that I am an adult; I learned to not being as picky about my food. I do try new things and my mom would be proud of me and of course, mom was right; I missed out on a lot of good foods. However, I’m still picky and I bet you are too! While you might not be picky about your food, you might be picky when it comes to reading God’s Word. Recently, I realized that I have been picky about certain books or passages in Scripture. Let me explain. There are times when I have come to certain books of the Bible or a passage of Scripture and I think to myself: “Oh, I know that story!” or “What does that really have to do with anything?” and that’s when it happens. I get picky! I would skip over those passages just like I did as a kid when I would skip over those veggies that were on my dinner plate many years ago. For example, last Sunday night I started a new series in Matthew and the first passage of scripture deals with Jesus’ genealogy. My first reaction was just skim over these verses. I mean, come on, we all have read the first 17 verses of Matthew every Christmas, right? Well, I do… I’ve read all the names and even tried to pronounce the hard ones; which sounds a lot like gibberish most of the time, but hey I try! So why read them again? I’ll just skim over them. However, in preparation, I began reading David Platt’s “Exalting Jesus in Matthew – A Christ-Centered Exposition Commentary” when I realized something: I was being picky. Just like when I was a kid when my mom told me that I was missing out on some good food; I was missing out on some great truths and blessings that are found in Jesus’ family tree! You ask: “There’s great truths found in a family tree?” You bet there are! There are some great truths about God’s grace found in and through Jesus’ family tree. What are those truths? Well…that’s for another blog! Here is the point: Stop being picky when it comes to God’s Word! The Bible is God’s love letter to us! All of His Word deserves to be read and studied. But by being picky with God’s Word, we’ve missed out on some amazing truths and blessings! My friend, If you have been picky with God’s love letter, then you have been missing out on some really good, no, great truths about God and how He feels about you! If you have been picky with God’s Word, I want to encourage you to go back and read and study those books or passage of Scripture that you have skipped or skimmed over. When you come to a passage that you have read a thousand of time, go slower and really read and think about what God is trying to saying to you. Ask God to show you something new within those verses! By not being picky, you never know what the Father might reveal to you! 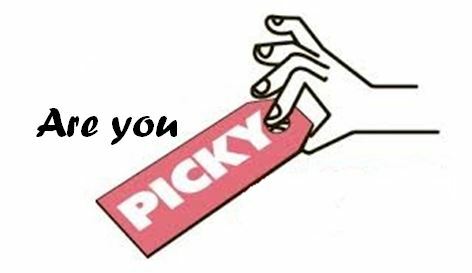 So, are you picky? Do you skip or skim over certain passages? If so, what parts have you been picky about? I would love to hear from you! I admit that I too have been picky. Skimmed over what “I thought I alredy knew” or “have read 100 times”. We get so much more out of God’s Word when we actually take the time to understand and relate it to our lives. The Bible is not a newspaper or some popluar magazine we skim over looking for the gossip section or latest hairstyle fashions. It is ALIVE … and we shoudl treat it as such. Don’t be picky! We miss so much when we are. Thanks Shane! You are so right, God’s Word is not the newspaper or some magazine! But how many times do we read it like it is? God has so much for us and it is found in His Word! That is how we are transformed! Thanks Matt! Before I went into the ministry, one of my pastors would always tell us, “You can’t build a theology on just one verse!” And he was absolutely right! Thank you, Jacob! Honestly, I sometimes get picky about Paul’s letters, like “Is he really saying God’s words or just getting into philosophy”? It’s easier to accept Jesus’ words as we believe He is the Son of God then Paul’s who is just a man of God. That’s my struggle. Dmitry you are most welcome and thank you for your honestly! I love it when fellow pastors are transparent the way that you have been. I understand your struggle! It is times like that we must just know by faith that Paul was inspired by the Holy Spirit to write down those words. For me it is just trusting that we serve an almighty God who is would not just allow philosophy into His Word to us! Praying for you my brother and keep on serving Him! Thanks Charles! You are right, most people struggle with being picky when it comes to Scripture for a variety of reasons. Would love to hear your answer!